We’re going to take a break from our regular sports betting preview this week and instead have a look at some of the exciting new slots you can play right now at bet365 Casino. One of the most exciting things about any membership at any of bet365’s sites is that you can access all of them from one single log in. You can transfer funds between accounts to play different games, bet on sports, play poker or even have a few games of bingo and of course, if you fancy playing a few slots then you have a wide choice of options with bet365 Casino, bet365 Vegas and bet365 Games all offering an extensive range of slot games to try, including those popular progressive jackpot slots. In this article, we are going to take a look at three of the more recently released slot games that you can play right now at bet365 Casino. We’ll explore each game in a little more detail and give you all the reasons you will need to load up the slot to enjoy a few spins yourself. If you fancy playing any of the slots listed below, then you can sign up right now at bet365 Casino and take full advantage of the current bet365 New Player Bonus offer which could see you earn up to £100 in bonus cash to play with at bet365 Casino. Alongside Frankie Dettori and AP McCoy, two legends of flat and national hunt racing, snooker superstar Ronnie O’Sullivan is the latest sporting ace to put his name to a new series of progressive jackpot slots that you can play at bet365 Casino. The Sporting Legends series of games all share the same progressive jackpot fund, which stands (at the time of writing) at a tempting £720,581. Alongside that big progressive fund there is also a Daily and Weekly jackpot prize fund, with each of the jackpots guaranteed to be won during the stated time period. Spins start at just 0.25 per spin and there is a total of 25 pay lines in play. The more you bet on your spin, the more chance that you have of triggering one of the three different jackpots available in the game, each of which is won entirely at random as you play the game. Alongside the jackpots, there are a number of other bonus features on the slot, including a 147 Maximum Break Free Spins bonus round which sees you receive 12 Free Spins, the first seven with a standard 1x multiplier, the next four a 4x multiplier and the final spin a 7x multiplier. There’s also a Championship Bonus game triggered when you land the Championship Bonus symbol on the first and fifth reels on the same spin. This allows you to pick from items to reveal cash prizes and advance to the next stage of the championship. You can keep picking items until you either reveal the Collect option, which ends the bonus, or you win the Championship. 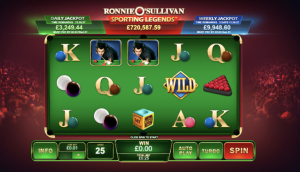 If you are a fan of snooker and Ronnie O’Sullivan’s own particular form of green baize genius, then Ronnie O’Sullivan’s Sporting Legends progressive jackpot slot is one well worth chalking your cue tip for. If racing cars is your thing, then the Buckle Up slot is one that you should definitely get your pedal to the metal for. This rather unusual looking slot boasts four reels. The first three reels are the standard game but each reel has four symbols visible. The fourth reel is the Booster Reel which can reveal a number of different bonuses which can increase the value of any win. Complete with a moving backdrop which makes it appear as if you are in a race and racing car sound effects, the slot looks and sounds the part. There are a total of 26 lines in play across the three-reels, which is rather a lot, and spins start at just 0.25 per spin, although you can increase that amount markedly if you prefer. At the start of each game you get to select which Wild you prefer to play with and whenever you land your selected Wild in the game, it will expand to cover the reel in full, offering you the chance of triggering more wins. Three scatters will earn you a cash prize and then move you on to compete in the next race in the series. The Booster Reel has a number of options which can be awarded on any spin. These include an Extra Wild booster, which adds a Stacked Wild to the first reel, the Extra Symbols booster, which turns non-winning symbols into winning ones, a multiplier booster which adds a multiplier of up to x25 to any win and the Level Up booster, which upgrades all winning symbols for a larger value win. As you progress through the slot, you unlock new circuits and the more circuits you unlock, the greater the cash prize you win for doing do ranging from 80x your bet to 160x your bet. 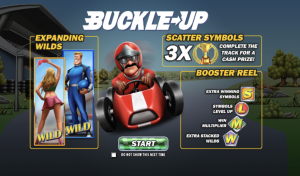 The Buckle Up slot looks very different to the normal slot but it is all the better for it and it is certainly one of the best motor-racing themed slots you can play today. 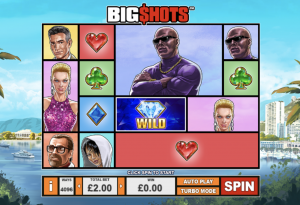 If you are a fan of Rockstar Games Grand Theft Auto series of games, then the style of the Big Shots slot will look immediately familiar. It is clar that the developer has used the seminal series of computer games as the inspiration behind this unusual looking six-reel slot but it is all the better for it. The game boasts a number of different characters, all of which are symbols in the game and the lower value symbols are the four playing card suits. There’s no pay lines, just 4096 ways to win across the reels and furthermore, all of the symbols in the game have big symbols on the reels too, which can be any size up to 4×4. Alongside the big symbols, the main bonus of the slot is the Free Games bonus which is triggered when you land the Free Games symbol across the middle four reels. When you do, you receive five free games and for the duration of these spins, all the lower value symbols are replaced on the reels with higher value character symbols, which can produce some larger value wins. You can also retrigger the Free Games bonus from within your Free Games spins. The game also boasts a Wild symbol, which is the diamond and this serves two purposes, firstly it can substitute for any symbol in the game, bar the Free Games symbol, and secondly, if you can land six Wilds across the reels, then you win the base game biggest single line pay out of 250 coins. 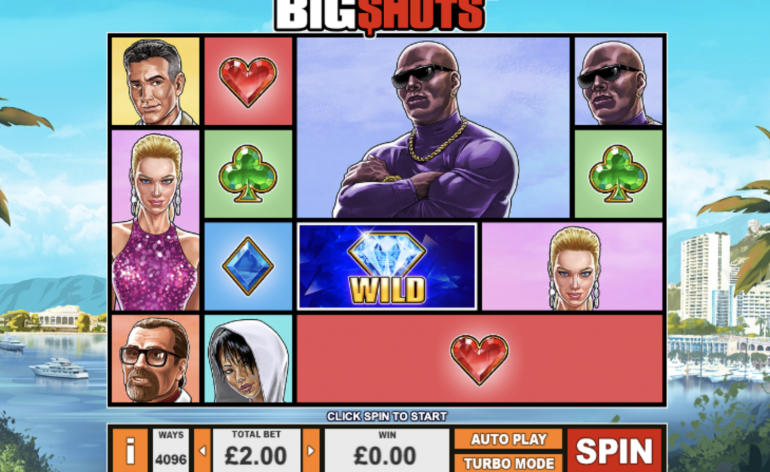 This is a very well put together slot and fans of computer games and in particular the Grand Theft Auto series of games will undoubtedly love what the Big Shots slot has to offer.